So you want to take the next step and actually go motor racing? The first thing you will need is an MSA National B competition licence. Association of Racing Drivers Schools leaflet. Have a racing medical examination with your doctor and ensure that the form is signed and returned to you - some doctors may charge for this. Driving test. The instructor will demonstrate the lines and technique to you before you drive for a minimum of 5 laps. Please remember that although you will receive tuition and help on your course, the main purpose is to test your suitability to hold a competition licence. Croft also run the Junior ARDS course for 14 to 16 year olds and up. The cost is £600. Below is the criteria for applicants: 1. The minimum age for a driver to take the course and hold a Race Licence is 14 years old 2. Application must be supported by or received from a Junior Race Championship organizing club. These are BARC (Junior Ginetta), BRSCC (T-Cars) and 750 Motor Club (SaxMax). Once they have completed the Junior ARDS Training Programme the registered Croft Junior ARDS Instructor will sign off their application. Their licence will then be issued in the name of the driver but held by the organizing club of their championship (until they are 16 years old then they will hold a full licence). For more information on the ARDS Junior Driver Training Programme, please call 01325 721815. Retains all the spirit and fun of the two preceding models with the often quoted kart like handling qualities - it is true, even on the skid pan. Making your driving experience gift extra special is our Gift Voucher. Inside the pack is a personalised presentation card of the driving experience - showing the exact driving experience the recipient will be attending. Also included is our full colour driving experience brochure with a list of driving day dates they attend to do their experience. We operate on selected days - please call the circuit (01325 721815) to register an interest. Drivers must hold a full road licence | On the day drivers must wear clothes that cover their arms and legs | Helmets, race boots and gloves can be provided. 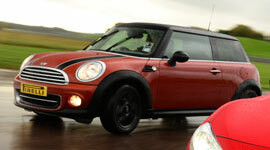 Juniors can now get behind the wheel of a MINI Cooper and learn the essential skills needed to drive a car safely.